was rummaging through my fridge one day and saw this bottle of gojuchang (a savoury and pungent Korean fermented red pepper paste) – see picture below. 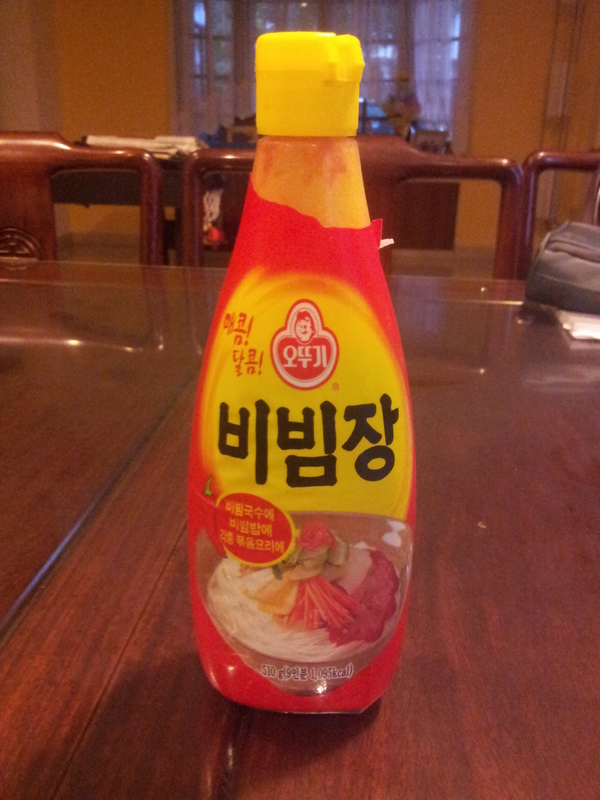 I must have bought that months ago from a Korean provision shop. It is supposedly such an indispensable universal seasoning condiment – and I do often take it at Korean restaurants eg for bibimbap (a signature Korean dish-a bowl of warm rice topped with seasoned sauteed mixed vegetables usually with a raw egg & beef) – but it seems that I have found no use for it. The bean sprouts & kang kong were just blanched, with the latter squeezed dry on a sieve to remove excess water as shown in the video. The celery & yellow onions I thought needed some sautee-ing, which I did to soften, and they turned out very well indeed. Prepare the squid – remove the head, wings & red skin. cut open the squid length-wise. for the chequered pattern cut, slice length-wise along squid 1/4in apart, careful not to cut through. then cut the squid in 1/2 length-wise. now slice across & cut through the squid every 4th cut – that will produce a 1in width cut with square-cut patterns. Make the salad – blanched the bean sprouts & the kang kong & squeeze out excess water from the kang kong by placing on a sieve. sauteed the celery & yellow onions. Cooked the squid in boiling water for 4minutes until cooked. In a large bowl, mix everything together – the squid, vegetables & the seasoning mix. serve. 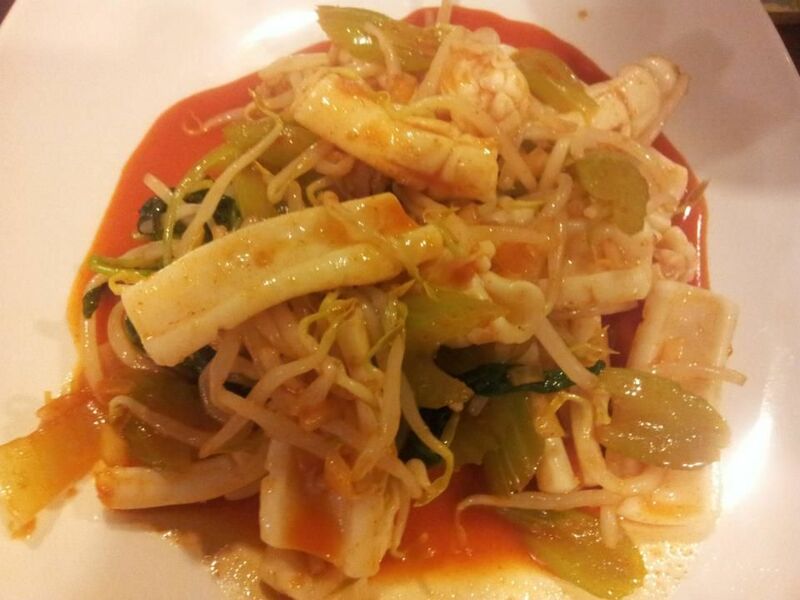 This entry was posted in Recipes and tagged gojuchang, korean, salad, squid. Bookmark the permalink.